INSciTS Special Interest Groups (SIGs) are member-led groups that provide a “home within a home” for INSciTS members to connect and collaborate with colleagues who have shared interests in the SciTS field. Create opportunities to engage as a community with external groups. Active SIGs are described below. “Example topics” offer a sense of the current scope of each SIG. Focus areas and activities of each SIG will evolve based on the interests and goals of SIG members. 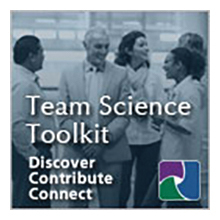 This SIG is for individuals seeking to develop programs and spaces that can serve to foster and incubate effective team science. The goals of this SIG are to articulate and promote the need for a dedicated career path around interdisciplinary research expertise, and to develop and improve practitioners' tools, best practices, success metrics, and career trajectories. Professional development – effective best practices, tools, methods, etc. SIGs are a dynamic part of INSciTS. Their goals, objectives, and activities evolve over time to reflect advances in the evidence base and the interests of SIG members. We welcome proposals for new SIGs dedicated to topics not already represented among existing SIGs. Any INSciTS member may propose a new SIG and may self-nominate or nominate other(s) for SIG chair/co-chair positions. Please include the following information in your proposal. Proposals should not exceed 1 page. (Optional, though highly encouraged) Proposals for SIG chair/co-chair, including names, titles, affiliations, and contact information. How do I join an InSciTS SIG? How are SIG goals, objectives, and activities established? SIG goals, objectives, and activities are developed by the members of each SIG and reflect the shared interests and aligned independent activities of SIG members. Can you provide some examples of SIG objectives? Can you provide some examples of SIG activities? Hosting SIG meetings at the SciTS conference. How and when do SIGs meet? SIGs meet monthly or every-other month -- at the discretion of the SIG members and chairs -- via videoconferencing/teleconferencing. Agendas and minutes are distributed to all SIG members. In addition, SIGs meet in person at the annual SciTS conference. How do SIGs communicate internally? There is a chair email address and member listserv for each SIG. What are the roles and responsibilities of SIG Members? What are the roles and responsibilities of SIG Chairs? SIG Chairs serve a two-year term providing leadership for a SIG. SIG Chairs develop networks within INSciTS and leadership experience within the organization. How do SIGs communicate with the INSciTS community, broadly? The INSciTS SIGs Coordinator supports SIGs in engaging with the broader INSciTS community. Toward this goal, the SIGs Coordinator and SIG chairs/co-chairs meet twice a year -- once via video/ teleconference, and once in person at the INSciTS annual meeting. They discuss opportunities, challenges and resource needs to optimize success, impact and value of the SIGs. In addition, at the time of each semi-annual meeting, each SIG is asked to provide a brief (1-2 page) report of its activities in the last 6 months, which will address the following: SIG goals, objectives, activities, plans, barriers and/or challenges, and requests for engagement and/or support from INSciTS. These reports enable the InSciTS organization to support SIGs with resources, communications, and strategic alignment of goals and activities across the organization. To help facilitate the visibility of the SIGs within the broader INSciTS community semi-annual SIG reports are sent to the INSciTS SIGs Coordinator [email protected] and the INSciTS Membership Chair [email protected] and posted on the INSciTS website.